Haryana Chief Electoral Officer (CEO) Rajeev Ranjan said this initiative will go a long way in encouraging women to vote and also ensure that elections are conducted in an efficient manner. All-women polling booth being set up in Haryana to increase the participation of women in the democratic system. For the first time in Haryana, ‘Sakhi Matdan Kendras’ will be set up in each assembly segment to spread the message of woman empowerment. 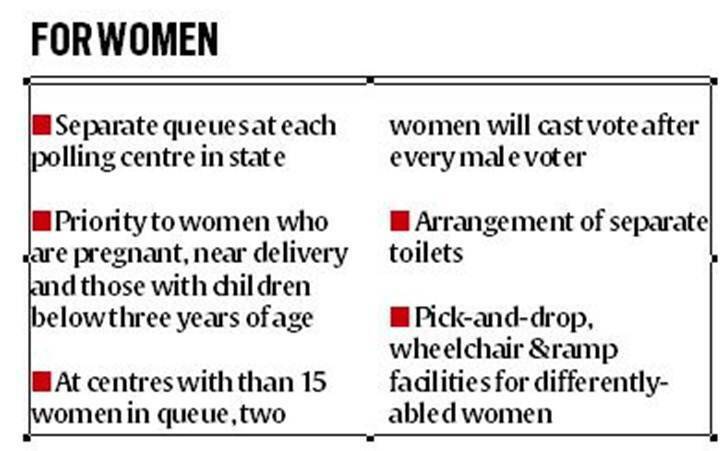 These kendras (polling stations), at least one in each Assembly constituency, will exclusively be run by women only. The CEO further said that the arrangement of separate queues for women will be made on each polling centre in the state. He said that at polling centres where the number of women in the queue is more than 15, two women will be allowed to cast their vote after every single male voter. He said that under the Systematic Voters’ Education and Electoral Participation (SWEEP) programme, women are being made aware regarding polling through Self Help Groups (SHGs) and Anganwadi workers.